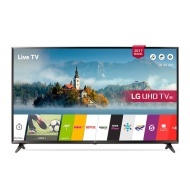 alaTest has collected and analyzed 54 reviews of LG 60UJ630V. The average rating for this product is 4.8/5, compared to an average rating of 4.3/5 for other products in the same category for all reviews. We analyzed user and expert ratings, product age and more factors. Compared to other products in the same category the LG 60UJ630V is awarded an overall alaScore™ of 89/100 = Very good quality. I bought this last week and it did not disappoint. Very good picture and the sound is great too, no need for a sound bar etc. TV has great sound and the picture is excellent. I definitely recommend you to get this TV before it's gone. A soundbar will enhance the sound also. Easy to navigate Good picture resolution Very good sound quality Like watching in a cinema! Great tv at a great value. Just a shame there is no 3.5mm aux imput. My 5.1 surround sound use aux input and sadly I can't use them on this tv. Other than that great piece of kit. Now THAT'S a television !! I bought this a month ago so far I'm happy with the look of it!